"When I first knew him, your father was already a great pilot. But I was amazed how strongly the Force was with him. I took it upon myself to train him as a Jedi. I thought that I could instruct him just as well as Yoda. I was wrong." 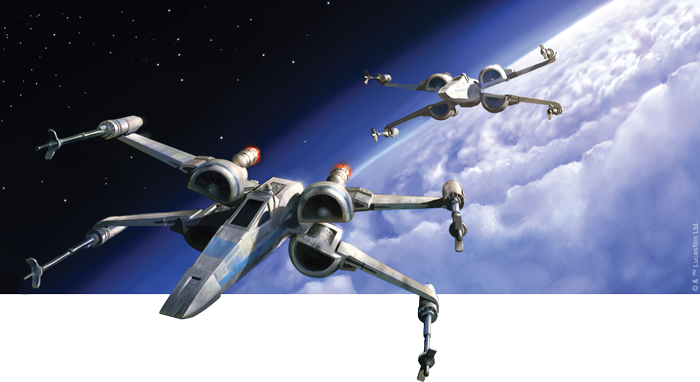 With its fast-paced miniature starfighter battles, X-Wing™ offers a unique portal into the Star Wars universe. Straight from the Classic Core Set or The Force Awakens™ Core Set, the game thrusts you quickly into an ongoing series of missions and dramatic dogfights as you and your opponent maneuver your starships, take aim, and fire. And its flexible rules for squad building make it easy to personalize your squadron with any number of your favorite ships and pilots. But if you're looking to expand your collection, where should you look first? 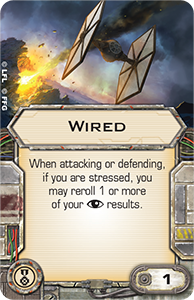 That's the question behind each of our X-Wing 101 articles, and each article offers a different answer. In previous articles, we've had an array of guest writers offer their suggestions, covering everything from competitive purchases to iconic ones, and from purchases that serve well to teach you the game to those that immerse you more deeply in the game's missions and their takes on the Star Wars universe. No matter the recommendation, however, the goal was a rich play experience for under 101 USD. Today, we continue our X-Wing 101 articles with yet another article aimed at a rich play experience for under 101 USD, but this time—as we look ahead to Father's Day in the United States and numerous other countries worldwide—guest writer Richard Greenaway offers us a list of purchases designed to offer a rich play experience not just for one player, but for two—you and your child. Hey there, parents! Would you like to improve your child’s literacy and math skills, or would you prefer to fly around the galaxy in a starfighter? Perhaps you see it as a difficult choice between what you ought to do and what you want to do, but there's good news… With the ever-expanding world of Fantasy Flight Games' X-Wing Miniatures Game, you can do both at your kitchen table. I know it’s true because that’s what my family does most Sunday afternoons, once lunch has been cleared away and the dishes have been done. As a parent, I couldn’t wait to show my two boys the Star Wars movies. And when I started to play the miniatures game, they wanted to join, too, lured by the opportunity to pilot the ships they’d seen on the silver screen. 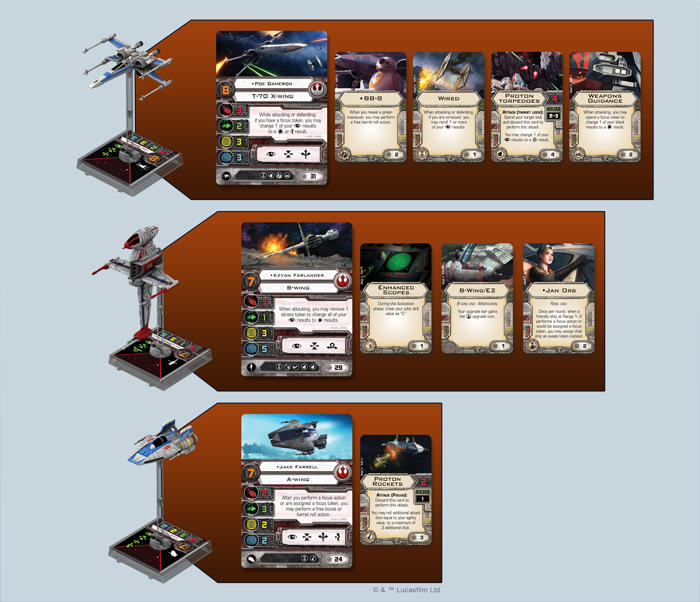 For my contribution to the X-Wing 101 series of articles, then, I have built two lists that can be used by new players—and their kids—to fight awesome space battles across the kitchen table. None of the components are used twice, so it’s possible to fight one list against the other. And, of course, the list of products weighs in at under 101 USD. 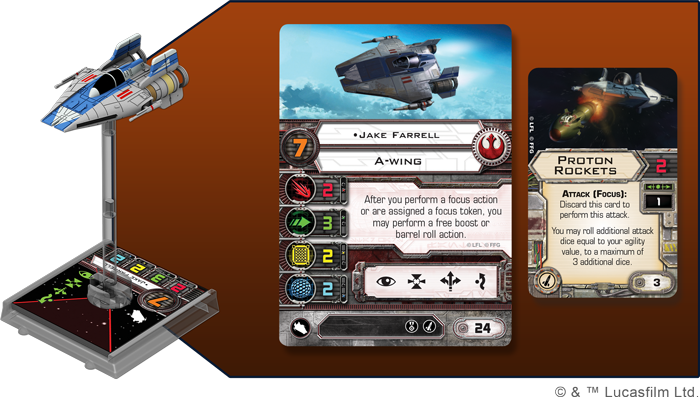 Our first list features Poe Dameron alongside a talented pair of pilots from the Rebel Aces Expansion Pack— Jake Farrell and Keyan Farlander . The first time we encounter the amazing B-wing fighter is during the Battle of Endor, and Keyan Farlander is one of the best pilots available. Also, as fans of Star Wars Rebels will know, a B-wing prototype also features heavily in one of the show's storylines. In X-Wing, the B-wing has loads of health for a small-base starfighter but only rolls one green dice when it’s defending. Its movement dial is a little unforgiving, so I have tried to take advantage of this fact. 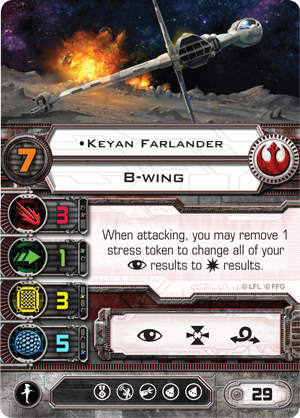 Farlander’s ability to make use of stress tokens is pretty useful because it’s quite easy to get the B-wing stressed. But while stress prevents you from carrying out actions, so does bumping into your opponent’s ships—or even one of your own. It’s always a pain to miss out on your action window, so how about always moving first and trying to avoid a bump? 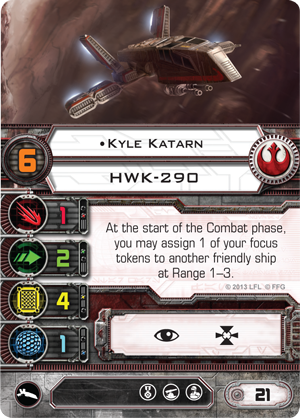 The addition of Enhanced Scopes allows Keyan Farlander to move first and get into position, but it doesn't sacrifice his high pilot skill in the combat phase. Then, in combat, Farlander’s ability allows him to remove a stress token to change any focus results to hits. Because you can trigger Farlander's ability even if you don't have a focus result, he ends up being a reliable attacker who can take actions or clear his stress almost every round. All the same, the B-wing only rolls one green dice in defense. So let's add an evade token into the mix. 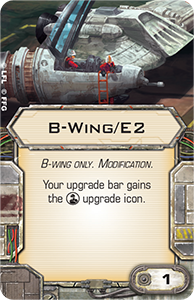 Keyan Farlander's B-wing in this list has been modified with the B-Wing/E2 upgrade, and that means he can take one crew along with him. 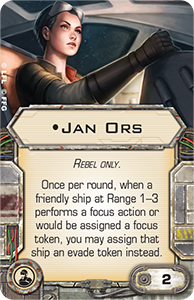 Jan Ors usually flies a HWK-290 with Kyle Katarn , but we’ve included her in the B-wing crew slot. 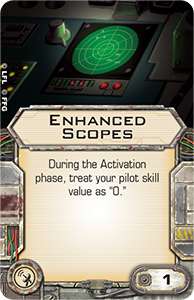 When a friendly ship performs a focus action (or is given a focus token), she can change that focus into a precious evade. The ability works at Range "1–3," and because the wording on her crew card does not say "another" friendly ship, you can use it on the ship she is helping to fly. 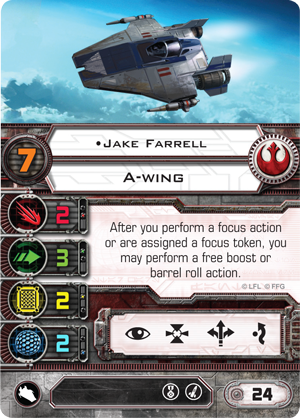 A veteran of the attack on the second Death Star, Jake Farrell used his agile A-wing starfighter to draw some TIE fighters away from Lando Calrissian and the Millennium Falcon. In my list, Jake is armed with Proton Rockets . These can only be fired at range one, but Jake’s pilot ability makes him a very slippery character. After he focuses, he will have a chance to boost or barrel roll into range "1." From there, he can then use his focus token to launch the rockets. The Proton Rockets give Jake a chance to make a single, truly powerful attack, and you will want to consider carefully whether or not to spend a round acquiring a target lock before you fire them. If you do, you risk suffering damage before you have the chance to fire, but if you don't, you greatly reduce your odds of getting the full five possible hits. After Jake fires his Proton Rockets, he remains a fast and slippery pilot, able to buzz around your foes, but his attack potential drops significantly. Firing his Proton Rockets for as many hits as possible is an important part of your strategy. Finally, I’ve chosen Poe Dameron to fly with these two Rebel aces. He leads the attack on Starkiller Base in Star Wars: The Force Awakens, and—of course—I had to include his trusty droid, BB-8 . 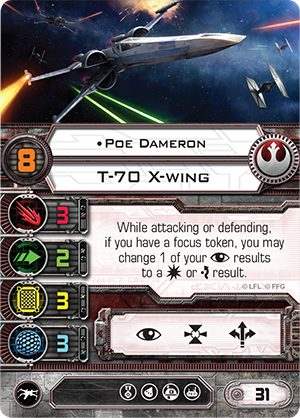 Poe's Resistance era T-70 is the latest type of X-wing and comes with ability to boost like an A-wing. This is a great action as it can help get you out of trouble, letting you slip out of arc to avoid your enemy’s shots, or it can get you into a better position for your own attack. 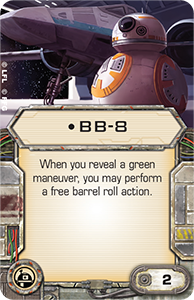 Boosting gives Poe a lot of flexibility in his maneuvers, and with BB-8, you can even get a free barrel roll just by choosing a green maneuver. Still, as good as boosting can be, the focus action is almost always the best choice for Poe. 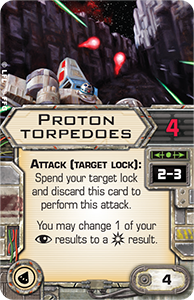 You might choose to take a target lock instead of focusing if you find Poe at Range "3" of your opponent and want to fire his Proton Torpedoes . 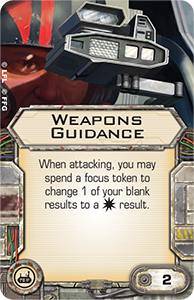 This secondary weapon gives you more attack dice and denies your opponent the extra range-based defense die, plus the Proton Torpedoes ability allows you to convert one focus result to a critical hit. But at nearly every other time, Poe Dameron wants to focus. When he has a focus token, he can either use his built-in ability to change one of your focus results to a hit or an evade result, or he can spend it with the Weapons Guidance tech upgrade to change one of your blank attack results to a hit. In fact, Poe is so good with his Weapons Guidance and pilot ability that he can convert a focus result with his pilot ability and then spend the focus for Weapons Guidance, making him an incredibly accurate and reliable marksman. Parents and pilots, this game—and this list—are great for discussing probabilities and math. The red and green dice are eight-sided, but when you have an active focus token on your ships, the chances of rolling a positive result are massively increased. This means that our first squad presents us an excellent opportunity to address the math. It's also a good list for looking at spatial awareness and planning ahead. The list is made for starfighter dogfights, and getting your ships in the right position takes some practice. In fact, deciding what you are going to do and recognizing the consequences of your opponent’s moves have led to fantastic discussions across the kitchen table where most of our games are played. Also, don’t forget to read all pilot and upgrade cards out loud. This has helped us a lot to understand them, and—for my children—has improved their literacy skills and confidence significantly. The boys’ teachers have noticed their vocabularies have increased with words like initiative, focus, and activate. 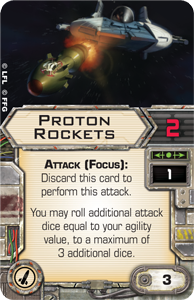 One example is that it was only by reading the Proton Rockets card out loud that we realized that the focus token you need to trigger the rockets is not spent but can still be used afterwards to change any focus results to hits. With three very different ships, this list should also help get you used to flying around a board without bumping your ships into each other. Once you master that, your goal is to try and use your ships together as a team to concentrate on one enemy target at a time. Once you’ve gained enough practice, you—like my sons—will be ready to pit your skills against the Imperial ships of my second list. But beware! The Imperial squadron is far from a push-over! The Greenaway family have been playing X-Wing since Richard bought the Core Set as a Christmas present for his children. They can be often found at tournaments across the United Kingdom as Richard vainly attempts to fly better than his two sons, Tim and Simon. 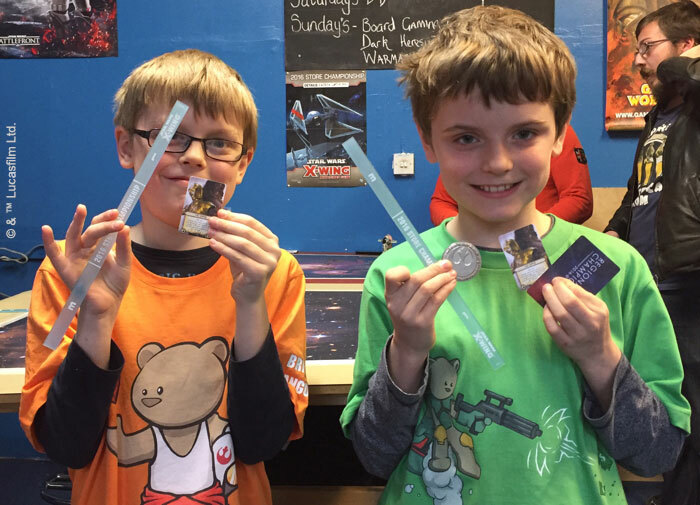 The author's sons, Tim and Simon, with the prizes from one of their X-Wing tournaments. Just as the Star Wars films and universe brings generations together, so can X-Wing and its fast-paced starfighter battles. But it can also set fathers against sons and mothers against daughters. If the children are the Rebels, then someone has to represent the evil Galactic Empire. Who will Richard field against this trio of Rebel aces? Join us tomorrow as he reveals the list with which he'll help the Empire pursue its tyrannical ambitions!